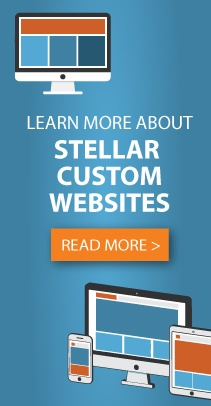 Stellar Blue Technologies, a Fox Valley, Wis. based digital marketing firm, launched a new custom website for Hillside Dental. Based out of Eau Claire, Wis., Hillside Dental is dental clinic with a team of experts, specializing in services like comfort dentistry, tooth restorations, crowns, bridges, and cosmetic solutions. This project was brought to Stellar Blue by Schmidt Communicates, an independent marketing consultant. The website is Stellar Blue’s first completed project for Hillside Dental. When users enter the website, they are welcomed by images of cheerful individuals with bright smiles. This aspect of the site supports Hillside Dental’s goal to attract new families and patients. The main navigation bar is fully equipped with drop-down menus that give users the proper information to make a well-informed decision when it comes to dental-related needs and wants. At the top of the home page, users see a Facebook icon, a “Blog” button, and a phone number to contact the clinic. Users encounter a “Book Appointment” area on the home page where they can easily schedule an appointment for a service. As the user scrolls through the home page, they view Hillside Dental amenities, as well as informative blog posts. The SmileChannel plays videos that feature best dental practices, patient examples, and personal hygiene tips. A photo gallery provides users with examples of real-time results, highlighting the capabilities of the team. Contact information is located near the end of the home page. The custom website has a unique, responsive design for use on a variety of devices. Built with WordPress integration, Hillside Dental professionals can easily and efficiently update the site on their own. Other features to note are the smile photo gallery, as well as an interactive blog.